Murder by Gaslight: A Dark Mystery. The Carlton House was a cheap hotel on the corner of Franklin and William Streets in New York City. The basement of the building housed shops and a laundry, and below them was a sub-cellar that served as a repository for ashes and refuse from the hotel and businesses above. In the fall of 1884, the Board of Health received several complaints about the unclean condition of the cellar. After inspecting the premises, the board ordered the owner of the property to remove the heaps of dirt and ashes that had accumulated there. After about a week of hoisting barrels of rubbish up to the street, one of the workmen found what he thought was a slender piece of wood. When he grabbed it and tried to pull it out, he dropped it quickly, with a cry of terror. It was not a piece of wood, but the leg of a woman, dried and shriveled. The workmen removed about six inches of dirt, uncovering the corpse of a young woman who had been dead for more than a year. She was wearing a black cloth sacque, with lace trimmings on the sleeves, a brown cloth dress and muslin underskirt. On her legs were blue and white striped stockings, partially worn away or eaten by mice. The flesh of the body had wasted from the frame which was now little more than a skeleton. The Carlton House was notorious for the number of suicides that occured there; at least 20 since 1868, but it was not believed that the woman killed herself. The street entrance to the sub-cellar was always kept locked and entrances through the hotel or the shops were not open to the public. There were no definitive signs of violence on the corpse. How she died and what she was doing in the sub-cellar was a mystery. The morgue was open for public viewing, and several people identified the body as a missing relative or friend, but only one identification was taken seriously. Charles Sprenger examined the body and the clothing and was positively convinced that the woman was his sister Johanna Schmidt. Her marriage had been an unhappy one; she and her husband, Frederick, quarreled violently over Johanna’s familiarity with Ludwig Hart, a barber who boarded with the Schmidts. Johanna left her husband on June 27, 1883, Hart disappeared then as well. No one in the family had heard from her since. Around the same time, Benjamin Gray who ran a print shop below the Carlton House, suddenly moved out. In the room he had occupied was a trap door to the sub-cellar. Charles Williams, who worked in a billposting office in the building remembered a disturbance in the sub-cellar one night, shortly after Gray left, sounding as if someone was trying to break into the hotel. An investigation at the time revealed nothing, but Williams was convinced that the murder had occurred that night. The police, who had been searching for Ludwig Hart were taken by how similar his description was to that of Benjamin Gray—slender, medium height, distinctive black mustache. They adopted the theory that the two were the same person. The police found Benjamin Gray—whose real name was Samuel S. Gray—in the New Jersey State Prison, where he was serving a thirteen-year sentence for attempting to murder his wife. Eighteen days before Johanna Schimdt disappeared, Gray married Mary Ann Downey and took her to live in Dover, New Jersey. Gray was a restless man, moving back and forth between New Jersey and New York, never spending more than a week at a time with his wife. After an argument over money in October 1883, Grey took Mary Ann into the woods, beat her with a club and left her for dead. She regained consciousness and returned to Dover, where she told her story, sending her husband to prison. 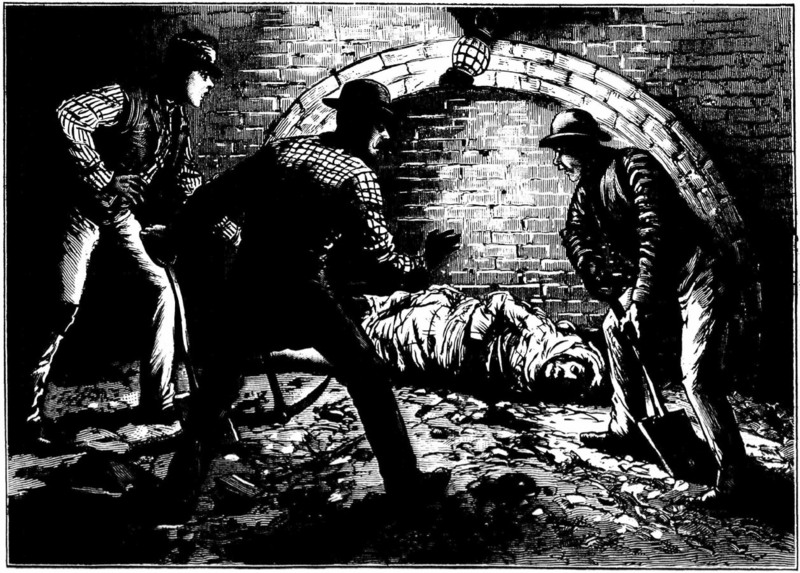 Gray, of course, denied any knowledge of Johanna Schmidt or a body in the sub-cellar of the Carlton House. Meanwhile, in New York, the identity of the body was once more in question. Charles Sprenger had been certain the body was that of his sister Johanna, but his younger sister, Emma, was just as sure that it was not. On December 7, it was reported that Charles Sprenger received a telegram from Johanna saying that she was alive and well. For the sake of her privacy, he would not reveal her location, but he was now convinced that the body was not Johanna’s. The police, however, were not convinced, and believing that Sprenger family was lying to protect their reputation, continued under the assumption that the victim was Johanna Schmidt. In the end, there was nothing to directly implicate Samuel Gray in the murder or even identify the victim with certainty. With an absence of any hard evidence, the murder case soon turned cold. Nothing had been accomplished by the investigation but the airing of two families’ dirty laundry. The “Carlton House Skeleton” was buried in an unmarked grave in New York’s potter’s field; the circumstances around her death remain a dark mystery. "A Dark Mystery." National Police Gazette 27 Dec 1884. "Dead in a Cellar." New York Herald 3 Dec 1884. "Identifying the Body." The Sun 4 Dec 1884. "Is He the Murderer?" Trenton Times 5 Dec 1884. "Mrs. Schmidt Alive and Well." New York Times 7 Dec 1884. "Not Mrs. Schmidt's Body ." New York Herald 9 Dec 1884. "Still a Mystery." New York Herald 6 Dec 1884. "The 'Carleton House' Mystery." New York Herald 7 Jan 1885. "The Carleton House Horror." New York Herald 5 Dec 1884. Identifying a year-old body in 1884 must have been quite a challenge. It's noteworthy that the police allowed public viewing -- that must have been because they thought it was their only chance to identify it. Had the science of identifying bodies via dental records developed by 1884, or did that only come with the advent of X-rays? But they already had a good idea who it was. For the most part, dental records were not available, and if the victim was not readily identifiable, they would often let the public view the corpse. The problem was false positives, especially if the head was missing or face distorted – everyone wanted to believe the corpse was their lost loved one. With clothing largely being handmade, that was often quite helpful in identifying bodies, but not in this case it would seem.